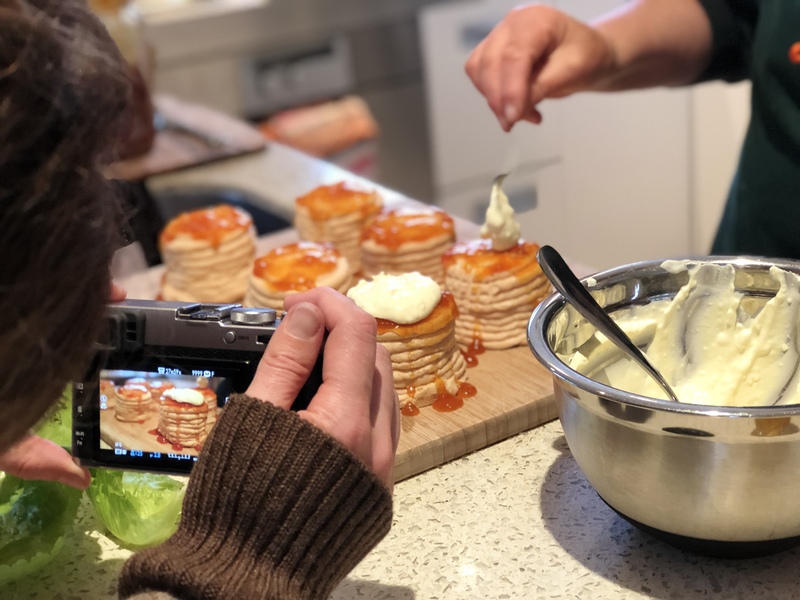 Salad Series I – the salad can be the star! I always want to give a salad the opportunity of being the “star” or at least the “co-star” on the table rather than an “extra” to the main course. On Sunday I made a salad for the Fortune Theatre BBQ and get together for cast and crew of “Calendar Girls”. It was a great evening that took place in a unique storybook house set high above Carey’s Bay. 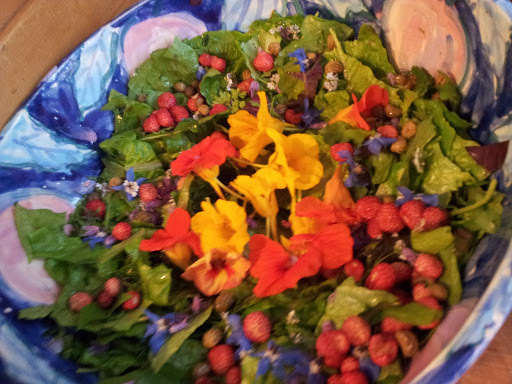 As we live on the other side of the Otago Harbour, I knew my salad wouldn’t travel well, so I decided to take all the pre-washed ingredients and dressing in a chili bin and made the salad up just before we ate. Everyone loved the freshness and flavours. Now I dress the greens and herbs in the bowl using a convenient spray vinaigrette “Damson Vinaigrette” from The Damson Collection. Its a real favourite of mine. Then a sprinkling of flaked sea salt and a good drizzle of extra virgin olive oil. Toss the greens. 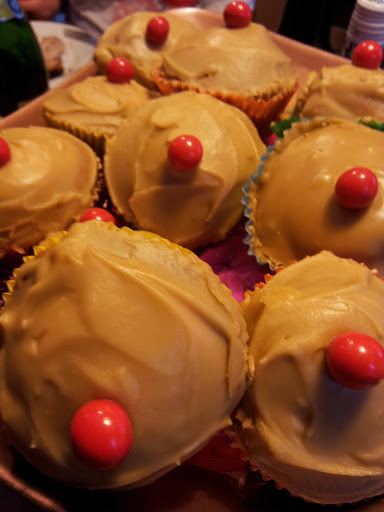 Its time for the decorative and tasty topping. I use chive flowers plucked for a spicy heat, blue borage flowers gently separated from their hairy bases, the delicate white coriander flowers and the bold as brass peppery yellow and orange nasturtium flowers. Luckily I have an abundance of wild small strawberries in the greenhouse which I add for sweetness. Final touch a sprinkling of pickled nasturtium seeds made last summer. 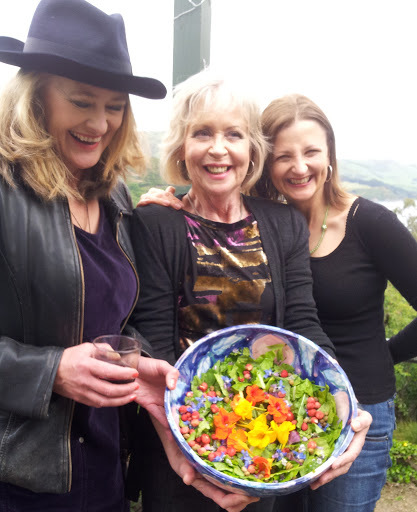 The red, orange, yellow and blue on top of the green drew an appreciative audience to my Calendar Girls salad. 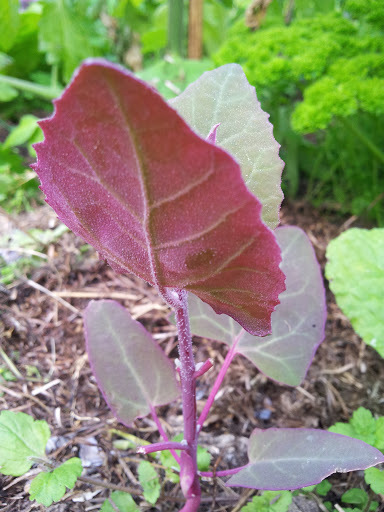 Red Orach (also aptly called Purple Passion Spinach) is something I was first introduced to in a friend’s garden. I took some seeds and carefully grew some plants in the greenhouse. Now all I have to do is to wait for them to pop up somewhere in the garden. If it does settle somewhere I usually let it stay. I love its velvety purple-red colour and spinach like texture with a hint of salt. This photo is of a baby seedling – eventually the plant will grow to around 60cm tall. The leaves can also be added to sauted greens although be warned the purple colour bleeds. Wild or Alpine Strawberries are called Fraises des bois (fruit of the woods) in France. 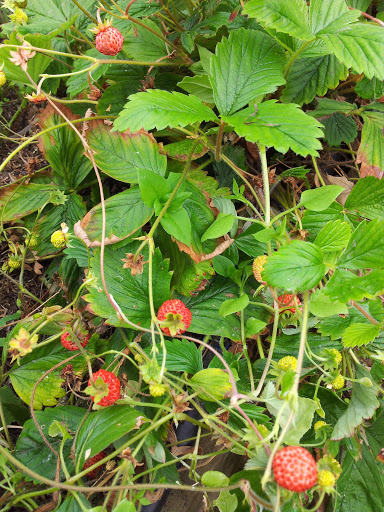 As the name suggests these little strawberry fruits can grow in any part your woodland garden. Quite often gardeners think of them just in oramental terms. The fruits are sweet and fragrant but do not keep well – you have to use them the day you pick them. In France they are used in fruit tarts but I have never managed to pick enough at one time to do that. They are perfect little flavour capsules to add to a salad and look so pretty. The plants readily self seed so once you find the best edible variety you will always have a sweet harvest from early summer until autumn. Every 2 years I take out the old plants and replace with young seedlings – after all that fruiting they just get worn out. I grow mine as an edging in my greenhouse so that I can pick a strawberry at any time while gardening. 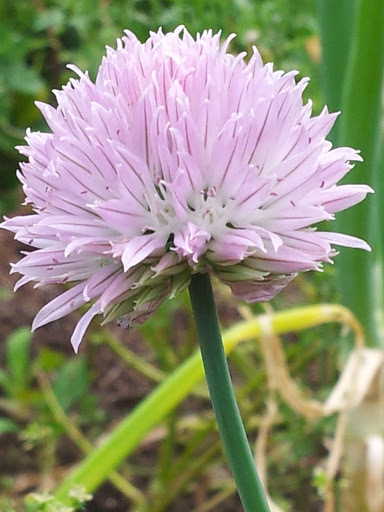 I haven’t used these pom pom flowers of the chive in my salads until now. I thought I would try them to see what they tasted like. They are delicious – quite hot and onion like, as the chive is from the leek and onion family. It would be too much to eat in one bite so I simply plucked the florets. The bowl the salad is presented in is also important if you want to make a big impression. 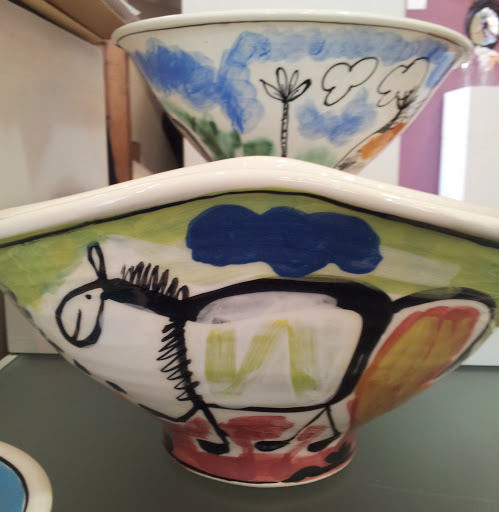 These fabulous bowls are made by Broad Bay potter Peter Henderson. Could be a great gift for the salad maker in your family this Christmas. 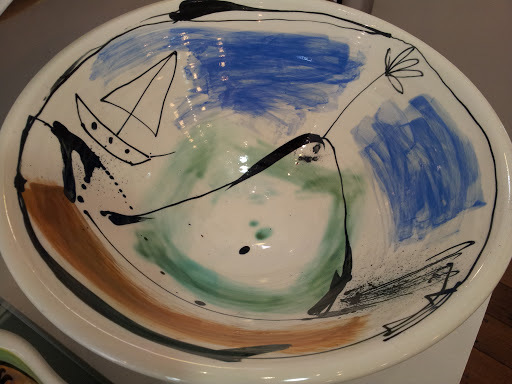 I love his use of colour and drawings and you can find them at the Quadrant Gallery in Moray Place, Dunedin. They are also practical – not too wide. While salads look wonderful in large round bowls they do take up a lot of table space.